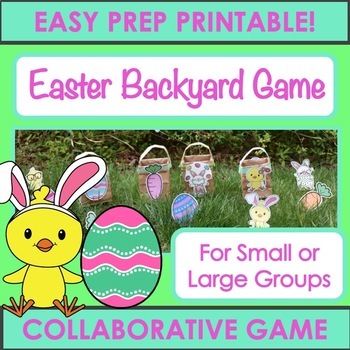 Easter Backyard Activity - Collaborative Game! ⇢ Provides children with the opportunity to practice prosocial collaboration skills, matching, and attending to the completion of a task. ⇢ Provide a fun outdoor activity for small and large groups of children during the Easter holiday season. ⇢ Provide children with the opportunity to practice seasonal vocabulary. ⇢ Provide children with the opportunity to practice color adjectives (for example, "I found a blue carrot!" 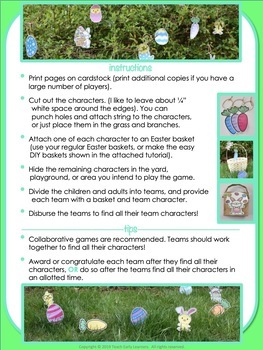 ⇢ Contains step by step tutorial for easy DIY Easter basket. 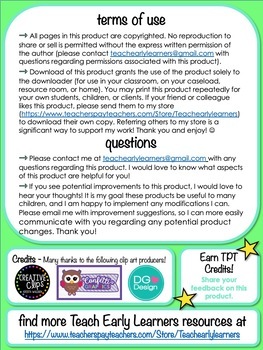 (you can also view a video tutorial at my instagram - teachearlylearners). ⇢ Please see the game instructions - included in the pictures associated with this product! ⇢ Nothing contained in this product is intended for use as a primary intervention for the diagnosis or treatment of developmental delays. Always promptly seek professional services with any concerns you have regarding your child’s development – if your child does have a developmental delay, it is beneficial to start services as quickly as possible.